Found 5 file extension associations related to Music Maker and 4 file formats developed specifically for use with Music Maker. Music Maker is an audio production software from Magic. With this application you can create and remix new songs or dub video recordings really easily. It is an all-in-one solution for audio, video and music. 3,000 new sound loop - in tried and tested MAGIX quality by internationally acclaimed producers. Media database - find every sound fast. Explorer splitting - simultaneous control of even more sounds. Sound loops and MIDI loops - thousands of new sound loops and MIDI loops. Enhanced design - enhanced design with extra features. MAGIX Vital Instruments™ - sound amazingly realistic and lively. 25 professional studio effects - Realistic Reverb, Echo and Compressor. 12 instruments, BeatBox and Synths - for unique beats, melodies and bass sounds. MIDI Editor - enhanced design and user guidance. Drum Editor - create unique beats quickly & easily. Effects-Presets - perfectly set effects. Vintage Effects Suite - lively, warm effects like Chorus, Flanger, Filter. Revolta™ Bass & Lead Synthesizer - powerful bass sounds & impressive melodies. MAGIX Mastering Suite 2.0 - professional mixdown of your music. Effect automation - individually customize selected effects. Guitar tube amplifier - unique tube sound on your PC. 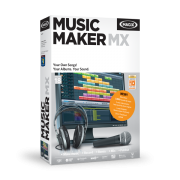 If you need more information please contact the developers of Music Maker (MAGIX AG), or check out their product website.